Quality and comprehensive support for aging adults with disabilities. Nestled within the suburbs of Creve Coeur is a community populated by St. Louis Arc residents. 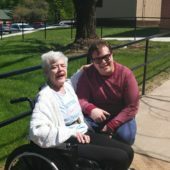 Here, we offer services that are designed to provide person-centered supports, promote independence, and ensure a safe and healthy environment for adults with intellectual and developmental disabilities. Our residents are your neighbors – they vote, volunteer, and are active in community events. We believe that all people should be treated respectfully, and our staff are trained to empower our residents in collaborative nature. 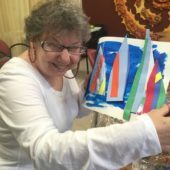 The Aging With Empowerment (AWE) program provides a wide variety of activities which include art, yoga, photography, cooking, community activities, and more. Join a community of older adults with intellectual and developmental disabilities that offers 24-hour support. 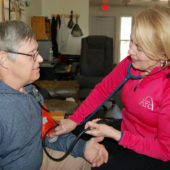 Our emphasis is to maintain the health of each individual, and encourage family and social connections, while being a valued member of the community. We are committed to the well-being of your loved one, for as long as we can safely provide care. Our staff receives continuous training on topics vital to an aging population. Training includes medication dispensing, diabetes, modified diets, grief and loss, hospice, and the effects of dementia on individuals with intellectual and developmental disabilities.